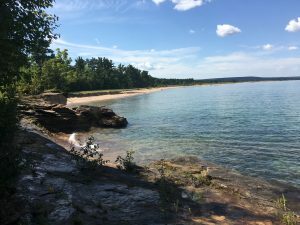 This gorgeous U.P. wedding took place on the shores of Lake Superior in Au Train at the family cabin. 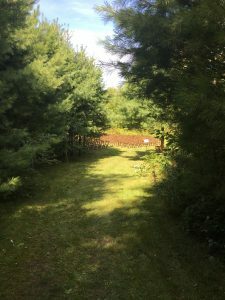 It was a beautiful setting, surrounded by trees and with the sounds of water and wildlife all around, and a hand-built chuppah decorated with flowers! The ceremony took place in a clearing close to the water’s edge. It was muddy and the hill was too steep to get the pedal harp down there on its cart, but I had a back-up! Knowing it could be an access issue, I brought my Celtic harp along, too. 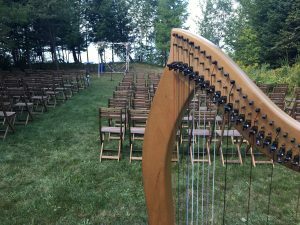 As a bonus, this allowed me to set up the pedal harp at the reception site on the cabin’s deck ahead of time, so there would be no lull in the music between the ceremony and reception. Everything was in place, so I could just sit down and play! For the ceremony, the couple opted for a harp and cello duet. Guests could hear the prelude music as they came down the hill. For the seating of family members, we played Pachelbel’s “Canon in D.” The wedding party came in to “The Luckiest” by Ben Folds, and Susanne chose every cellist’s favorite, “The Swan” by Camille Saint-Saens, for her processional. 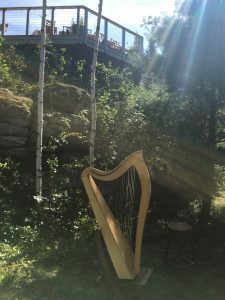 As a wedding harpist available throughout the Upper Peninsula (plus Northern Wisconsin, Mackinac Island, and Northern Michigan), I would love to provide elegant music for your wedding! 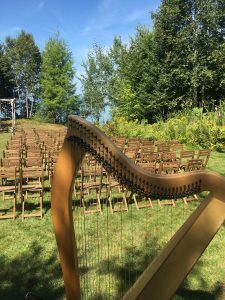 Harp music, either alone or collaborating with other professional musicians, is the perfect accompaniment for your ceremony, reception, rehearsal dinner, or bridal shower. 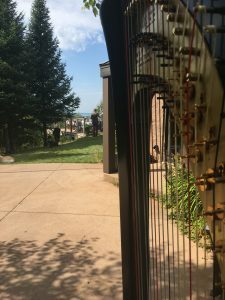 You can contact me via my website ~ Upper Peninsula Harpist ~ for a quote! 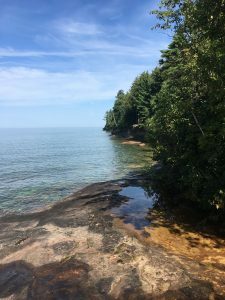 This entry was posted in Outdoor Wedding Ceremonies, Wedding Receptions, Weddings and tagged at home, au train, blevinsong, ceremony, ensemble, northern michigan, penti, reception, upper peninsula, wedding. Bookmark the permalink.